The Ódor excuses are rank and all-too-familiar attempts to put a sanctimonious spin on the calculating and anti-social malfeasances of the Hungarian government. Blaming the EU and the media for bearing witness to the Hungarian government’s heartless and reckless mistreatment of the refugees — instead of owning up to it and remedying it — is a signature tactic of this scruple-free regime. Overwhelmed by an unexpected crisis not of their making? The months of advance preparation in the form of a concerted nation-wide hate-campaign against migrants and the fortune spent on hastily building a makeshift razor fence whose only bloody victims were migrant wildlife — was that all done sleep-walking? So that now, being caught unawares by a humanitarian catastrophe — with no government provisions whatsoever for feeding, sheltering, reassuring and registering growing numbers of exhausted men, women and children, not even a public address system that can tell the bewildered and frightened victims in their own language what is happening and what lies in store for them — was the only possible option under the circumstances? The victims — repeatedly called “economic migrants” and not refugees in the Hungarian government’s lengthy advance propaganda campaign against them, well before they even arrived — are right now detained for days outdoors by police cordons in the rapidly dropping temperatures, with the only food, water, tents, medical aid and information being provided for them by individual Hungarian citizens and volunteer organizations, not the Hungarian government, which is busy building hate and fences, along with hastily dispatching its ambassadors with stretched, sanctimonious and legalistic excuses to the rest of the world. Unable to stop the worldwide media from bearing witness, the only thing the Hungarian government wants to do now is to get the victims herded into refugee camps, out of the public view, where even Amnesty International has been refused admittance. The Hungarian government reckoned well that (with the help of its own domestic media control) its hate campaign would desensitize and brutalize much of the Hungarian populace (the wonderful volunteer helpers are alas just a small minority). But perhaps they didn’t reckon with the effect this very graphic glimpse of the Hungarian government M.O. would have on the rest of the world, which, till now, had not been quite ready to believe that the alarm signals about what is going on in Hungary were not exaggerated. The plight of the refugees was simply stoked in every way by the Hungarian government in order to divert domestic press attention from mounting government corruption scandals (so far just minor mysteries to the world press) that could threaten the government’s electoral base. A muscular stance, resisting the alien hordes, in contrast, wins Hungarian votes. But, just as an insurance policy, the primary reason for fomenting the refugee crisis was to provide a pretext for introducing new police-state laws that will be adopted September 15, but will last long past the refugee crisis — laws that will allow warrantless entry into homes on suspicion of harbouring refugees, lengthy prison sentences if found guilty. (The current PM’s arch-rival, the former PM, could immediately be imprisoned as he has been sheltering an average of a dozen refugees every night since the crisis began, as well as feeding them and providing medical care. The current PM has been seeking — so far in vain, because the Hungarian judicial system is not yet 100% under his control — a pretext for imprisoning the former PM. Princeton University’s renowned constitutional-law expert, Professor Kim Lane Scheppele, who has been studying and warning about the Hungarian government’s abuse of its 2/3 majority to adopt an undemocratic constitution has written an extremely sobering analysis of what the latest piece of legislation portends. You do not help your case when you accuse Orban of something he could never do and would never do. You seem to want to reap the dividend of Orban doing it – before he’s even done it – and that is to imprison Gyurcsány. Isn’t there enough to hang Orban without accusing the thug of something he hasn’t – and won’t do? Stick to reality – you have enough on the charge sheet without fabricating evidence. ……and before you ‘educate’ me about how Orban has been out to ‘get’ Gy, without success, we know that too. Orban is mendacious and Machiavellian too – but something as naively political as to imprison Gy for taking in refugees is not in his opus. Thanks @JGrant. I must have peer review on my mind! I will have to ask Chris to correct it as I have no control. ‘Technically’ possible applies to anything Orban does. You know what I mean – you are over-egging the pudding. Apparently the legal facility may now have been withdrawn. ……and I prefer to read responsible dialogue on here. I’ll use my imagination at my choosing – not when patronisingly told to do so. Many thanks to Tappanch (on Hungarian Spectrum) for the information that Orban has back-pedalled on the warrantless search clause of the forthcoming September 15 make-a-law. It is of course the usual Orbanian peacock-dance: two steps forward, one step back. It’s the way he has steadily eroded all laws not to his liking, as well as press freedom, judicial independence, private property, free markets, etc. — all freely interlaced with bogus criminal charges and smear campaigns against opponents, pursued while they are needed to create a diversion, or for a hate-campaign, and then dropped much later with neither apology or acknowledgement, once they’ve done their damage. The next step is to sneak warrantless search back in again later, under another pretext, in another context, together with some other attention-getting outrage that Orban will then likewise prominently mitigate (provisionally) while the warrantless search power slips through, eclipsed. Orban likes to have the technical legislation on the books, so he can document how meticulously he sticks to the letter of the law (which he re-wrote yesterday). My contacts in Hungary are legal eagles too. How can Odor look his own family and children in the eye when he publishes bald-face lies about a human tragedy unfolding in his disgusting, wretched little country? The Orban government is scum, and so are all of its diplomats, who work to uphold a nazi system at the heart of Europe. @Sean Turner: I used to think that the difference between Fidesz and Jobbik when they both advocated the same ugly thing was that the Jobbik yobs were just viscerally bigoted brutes whereas the Fidesz zombies were, rather, anything-goes criminals. Probably megalomania, too, grew on him, with dreams of the Peacock Throne, in the Sandor Palota. 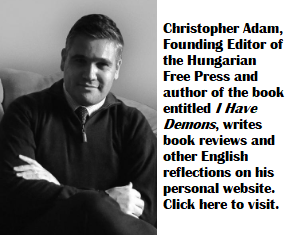 Just imagine a newspaper editor receives Ambassador Ódor’s lengthy explanation… it will reinforce his notion that something is seriously wrong with the Hungarian Government and their diplomats. Letters like these are counterproductive. What was Amb. Ódor thinking?